Sporicidin® Microbial Test Kit is an easy, fast, and accurate tool for detecting potential micro-organisms on many common interior surfaces. It determines the presence of microbial growth such as bacteria, mold fungi, blood and body fluids, as well as typical allergen contaminants in less than one minute. 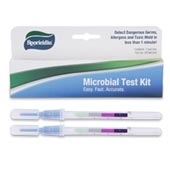 The Sporicidin Microbial Test Kit is useful in residential, commercial, and industrial applications. Detects mold growth in less than 1 minute. Easy-to-read results allow you to quickly check for microbial growth. A Green result indicates that there is no presence of microbes. A Gray or Purple result means that microbes may be present. Cost effective when compared to traditional test methods. Detects viable and non-viable mold spores. Convenient size allows for easy sampling at initial or post processing service calls.